My father had his cataracts done twenty odd years ago, when doing it in day clinics was in it's infancy. He was a bit sore and rough for the next couple of days but then there was no stopping him. I'll be getting my invite for my yearly retina scan anytime now, your name goes down for them as soon as you are diagnosed with Type 2 diabetes. Think positive refuse to let the effects of ageing spoil your fun. Nothing exciting, but a step nearer with the steel sided 13 Ton Medium Goods. 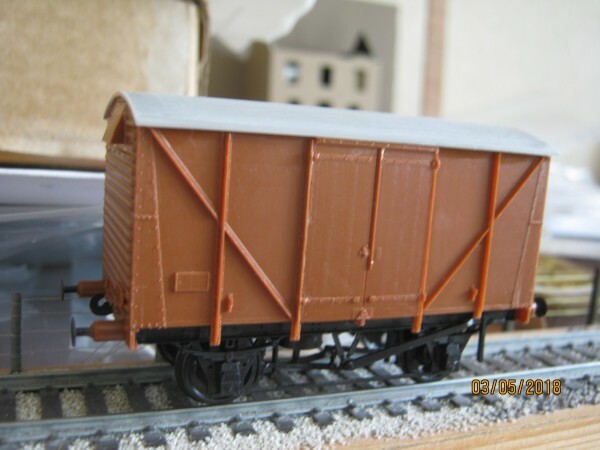 unpainted 2+2 planked van that is to become SR ownership ! 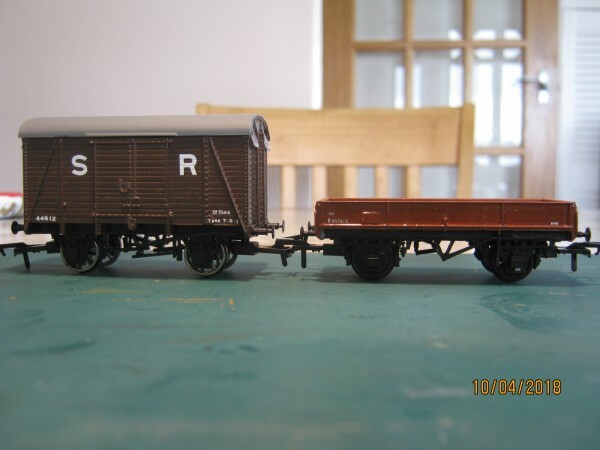 Bachmann wagon prices, am I glad my collection is as complete as it needs to be. an unpainted item, at £6 each you can't go wrong. 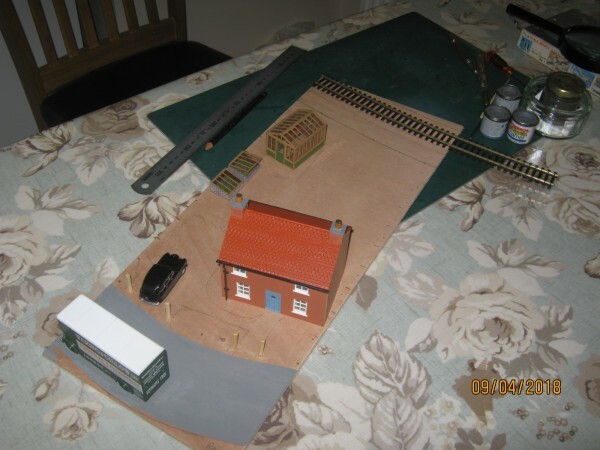 on a section of club layout and now want to do another country scene for myself. scene, as opposed to painting a flat 2D image on paper. 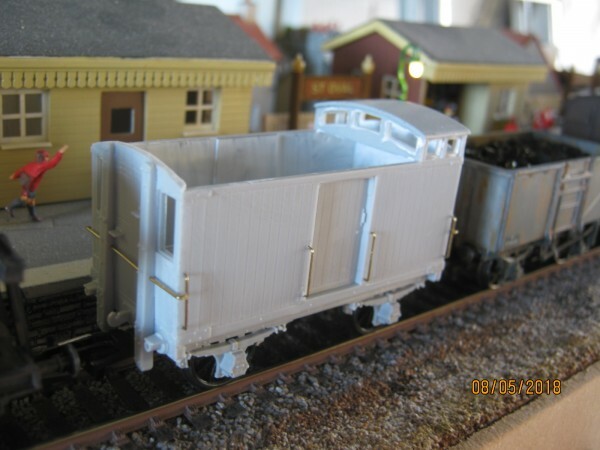 waterslide transfers used on the Parkside 13 ton medium goods. particular just dots to fit between the tare weight. that steel sided open which is going to be used for collecting ash & clinker. 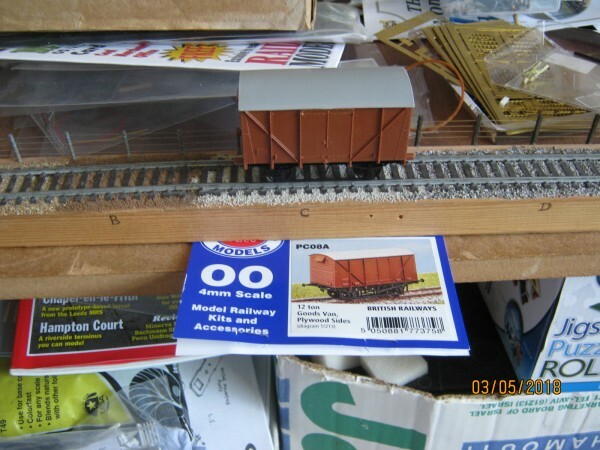 Oh and to replace those droopy Dapol couplings !! Both look very good Geoff, 2 more for the ever growing collection! 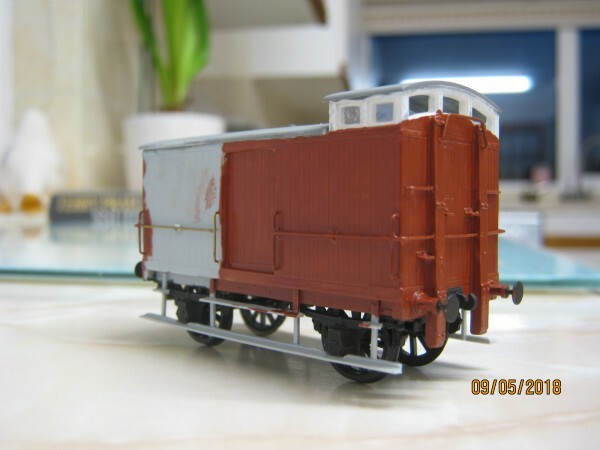 Do you matt varnish (with a brush of course ) now the decals a fixed and then weather? not take any off if it were too heavy !! and need to check my TOPS list on the computer to find any individual wagon. quantities of 5 ...... this will give me 22 !! I had to try something new on my latest little diorama board. 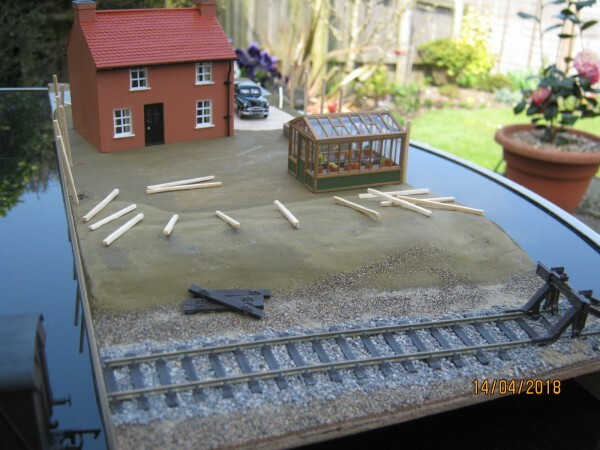 Dave of this parish was always dissatisfied with Peco track sleeper spacing. 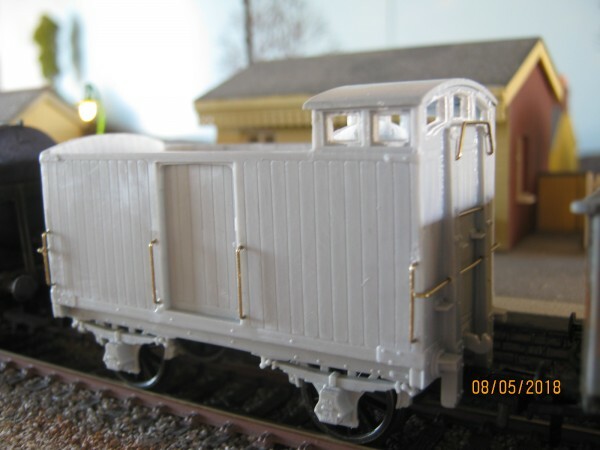 the under rail web and increase sleeper spacing, small enough to not be a pain ! simply too much work and wouldn't look right with unmodified points. This is all very basic, but every small diorama I like to try something different. Those 4 loose sleepers are what was removed on this small piece of track. That's a dream back garden Geoff, a siding at the bottom, when can I move in? Lovely job in such a small space. At a price Jim ! have a ply van in the yard. No sequence of pictures, but here it is in current condition. but I'm happy enough with what I must have sanded off. Probably finish this today although I should be grass laying on the diorama. years to come ...... 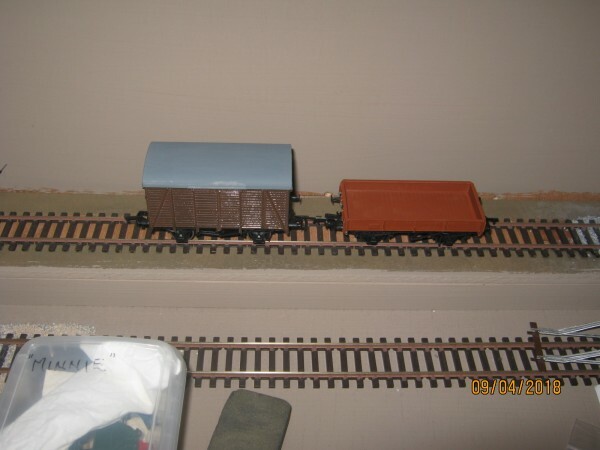 But I need to BUY some more wagons !! 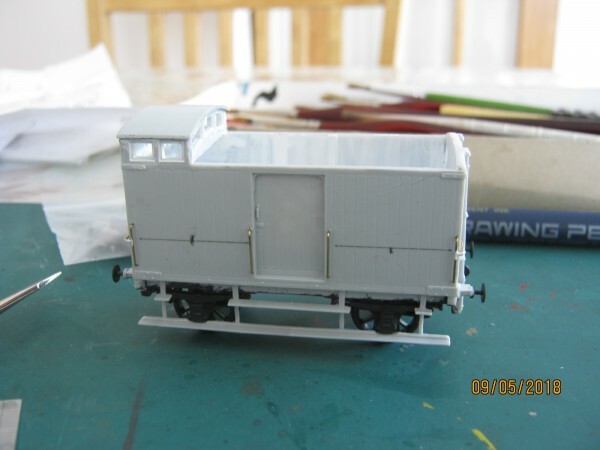 All done except couplings, painting & decalling. each side ......... will anyone notice if it's not there ? This was so easy and I like my results, have to buy another, or more ? Now for something the same, but different !! away for a few days and I looked in the packet and swore one fret was missing. Running chassis being tested for performance by running forwards and in reverse. they suggest you solder at joints !! It was never my intention to have one of these ........... let's see how it turns out ? 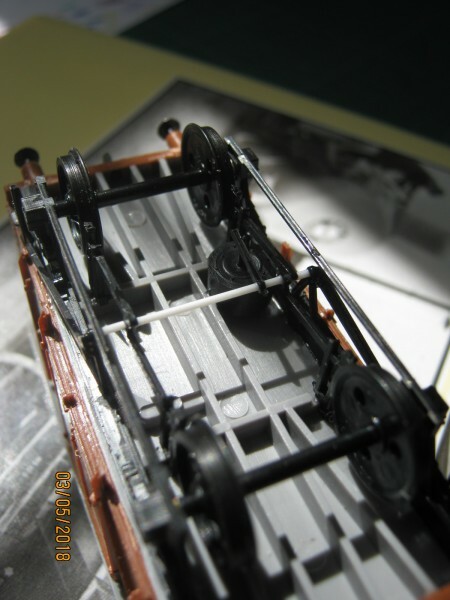 At least I know the chassis is a good runner, tried in various places in a 13 wagon rake. a pleasure to use and I hope to finish this by the weekend. to run with it, either that, or it'll become an interesting siding queen !! I have always liked those Geoff. I just wish I had a justification for building one. If one of the GWR’s absorbed railways had them I could but it’s just too North Eastern. Did you solder the handrails? Very nice. They have a very unique look to them. That's an oldie!! Lovely job Geoff. What a difference the paint makes, cracking job. a very delicate model and isn't up to much handling. any further manipulation after the first bend !! is on the way !! two over the last few years, but none as trying as this with all it's brass wire !